The ongoing battle over open access vs. journal subscriptions took an unexpected turn today with the announcement of an new, extremely-exclusive, scientific journal. 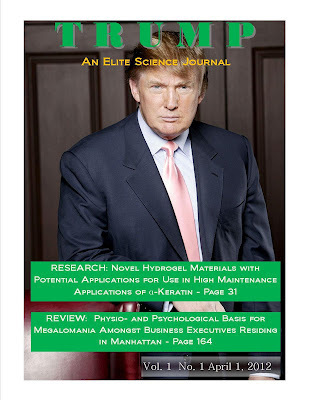 "Trump, An Elite Science Journal" released issue number 1 today, the cover of which is seen here. Standing in front of the newly established Trump Institute for Advanced Studies located in Trump City, Mr. Trump stated, "There is no way in the world that this journal would ever do anything as trashy as being open access. The name "Trump" has always implied the best of everything, whether it is Trump water, Trump vodka or Trump Bull Manure. No, this journal will be the most exclusive in the world. You must be a Nobel Prize winner to be authorized as either an author or a subscriber. The best always is exclusive." The Donald is the Editor-in-Chief of the new journal. He stated "I tried to find someone else to run it, but I couldn't find another editor that was willing to kowtow to me in the manner that I am accustomed to. You know how on my #1 TV show, "The Apprentice" everyone calls me "Mr. Trump" and never Donald? Well, I insisted that the editor call me "Doctor Trump" since I now have an Honorary Doctorate from some little school in Scotland or somewhere like that, but I couldn't find anyone willing to do that. Not even Stuart Cantrill or Neil Withers from Nature Chemistry. The nerve of those guys. Why they can go pound vegemite scones up their haggis for all I care! And that no-good Chemjobber is more useless than a perforated Schlenk line in helping to find someone for the job. What an awful recruiter he is." When reminded that CJ is not a recruiter, but in fact a working chemist, Mr. Trump stated, "Well that settles it. 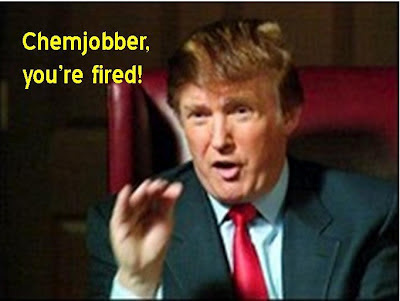 He's fired! ", while performing his characteristic snake-strike hand gesture. Donald Doc finished by stating, "To those of you who think open access is the wave of the future, all I can say is 'Aw Phooey'", before waddling off the stage. Hehehehe. Somehow, I focused on the cover and completely missed being given The Trump Hand. It stings. More proof of your incompetence as a recruiter! You're just like a bad recruiter who reads the first half of our resumes, sees we're chemists and then thinks we would be a perfect fit for an opening in video game development because it requires "good team chemistry".